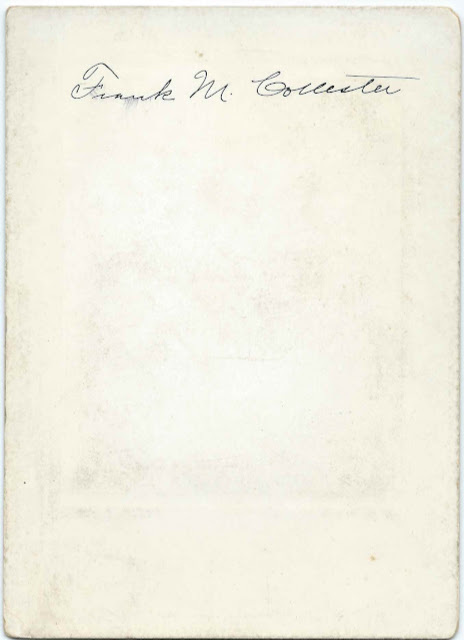 Photograph taken by the Pearson studio of Calais, Maine, of a young woman identified on the reverse in her own writing as Emma E. Gillis, "Lizzie". 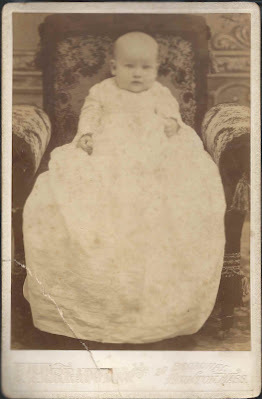 Emma Eliza Gillis was born 5 November 1874, possibly at Calais, Maine, the daughter of John Gillis and Margaret Ann (Ross) Gillis, who were born at St. David, New Brunswick, and Tower Hill, New Brunswick, respectively. I believe John Gillis' parents were Irish immigrants Michael and Alice Gillis, but I'd like confirmation of that. 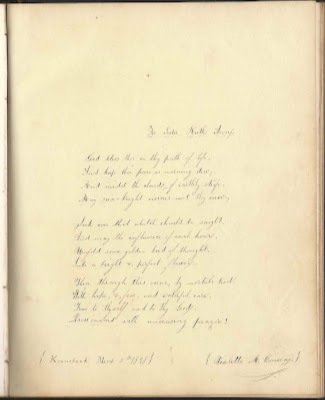 The parents of Margaret Ann (Ross) Gillis were Hugh Miller Ross and Mary A. (Thompson) Ross. Emma Eliza Gillis was still at Calais, Maine, by the time of the 1910 Census, but at some point soon after she had found her way to Manitoba, where I think it was this Emma who was enumerated at Brandon, Manitoba in the 1916 Canada Census of Manitoba, Saskatchewan and Alberta and who gave her year of immigration as 1913. 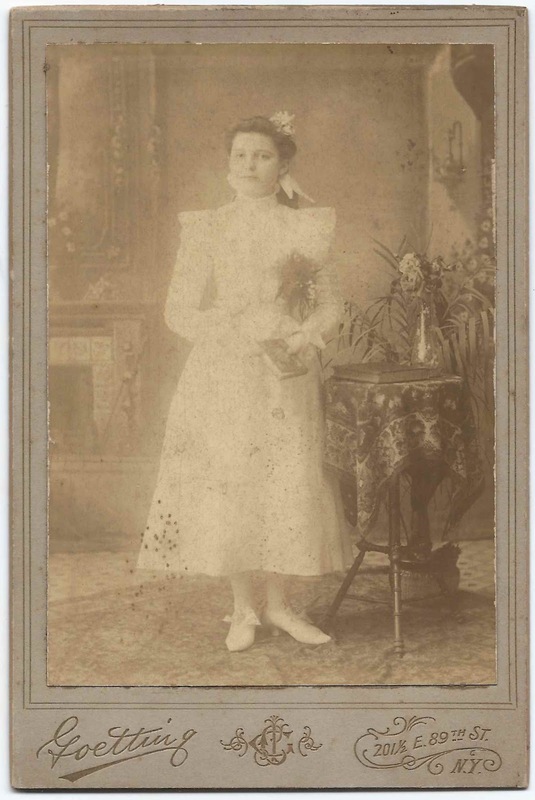 Emma's sister Carrie Grainger Gillis married Oscar Longfellow Boyd at Winnipeg, Manitoba in 1907. Whether Oscar went to Winnipeg first and then sent for Carrie, or Carrie had relatives in Manitoba and had gone on her own, I don't know. 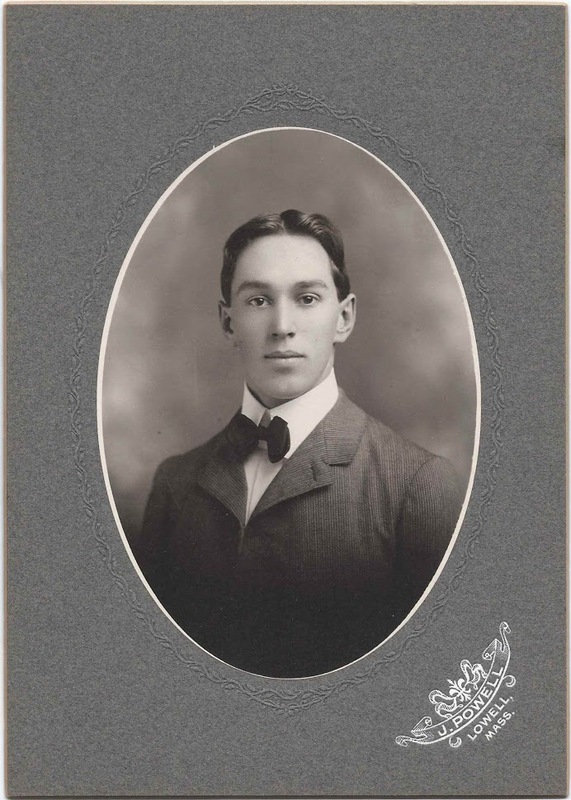 Oscar was born at St. Stephen, New Brunswick, just across the St. Croix River from Calais, so it is quite possible that they had known each other from youth, but they could also have met at Winnipeg through other New Brunswickers. By the time of the 1921 Census of Canada, Emma was living with Carrie and Oscar at Winnipeg, Manitoba. She didn't give an occupation but was perhaps helping Carrie with her four children. I can't quite decipher Oscar's occupation, but it looks as though he was a manager for the city of Winnipeg in some department. I don't know if Emma ever married or had children. I believe she died at Winnipeg, Manitoba, in 1960. 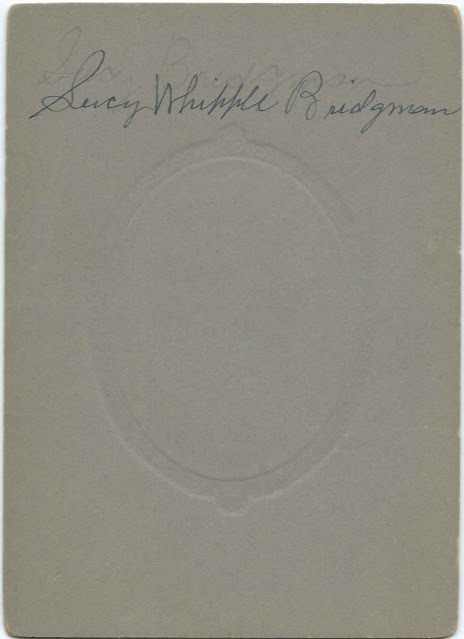 Photograph of a young woman identified on the reverse as Lucy Whipple Bridgman. 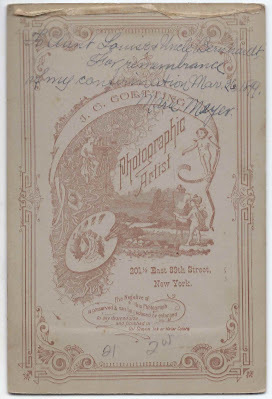 There's no photographer's mark, but Lucy lived at Westhampton, Massachusetts, and Boston, Massachusetts. Lucy graduated from Northfield Seminary and from Gordon Bible College. This may be her graduation photograph from one of these institutions. 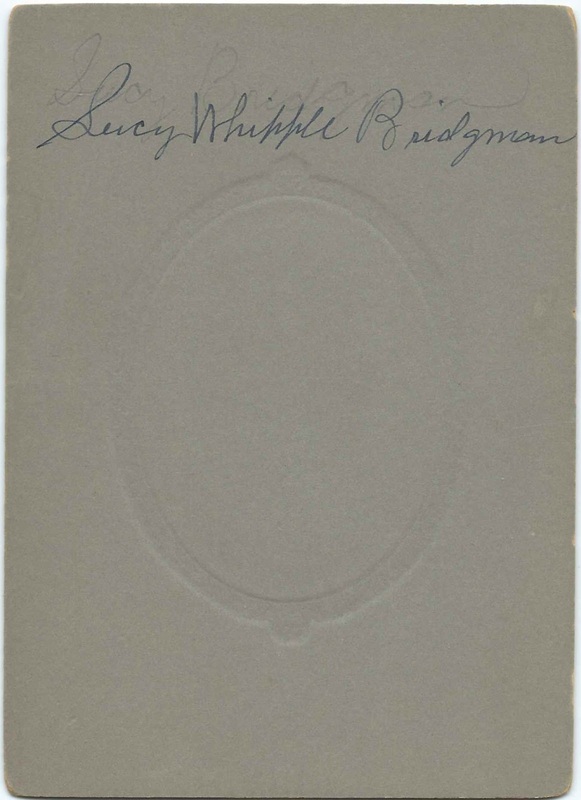 Lucy Whipple Bridgman was born 9 July 1893 at Westhampton, Massachusetts, the daughter of Edwin Burt Bridgman and Mary Sophronia (Bridgman) Bridgman. Her paternal grandparents were Federal Burt Bridgman and Sarah Hyde (Kimbel) Bridgman. 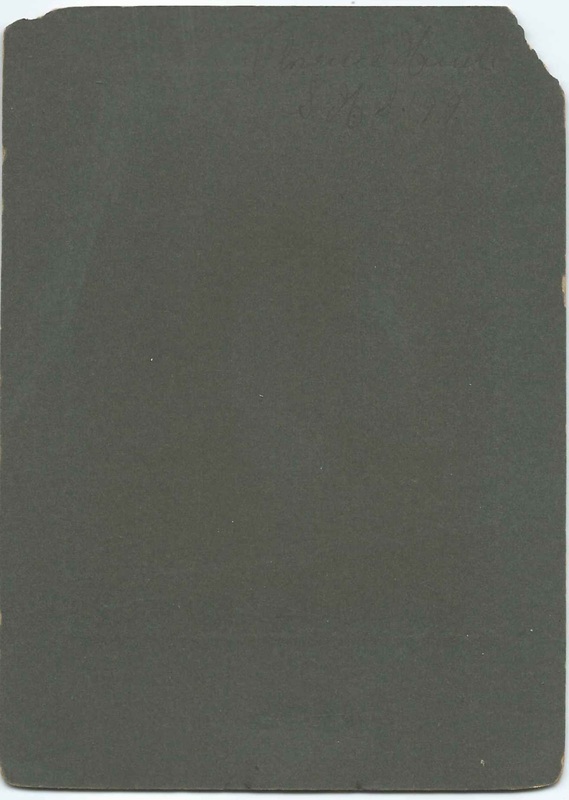 Her maternal grandparents were Lucas and Martha (Jewett) Bridgman. 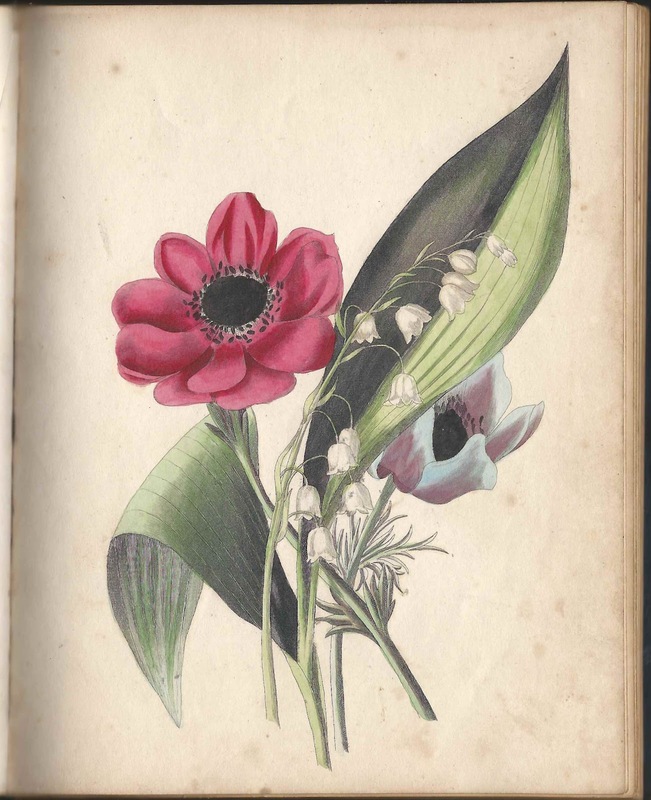 Lucy was secretary at the Congregational House in Boston for 34 years. 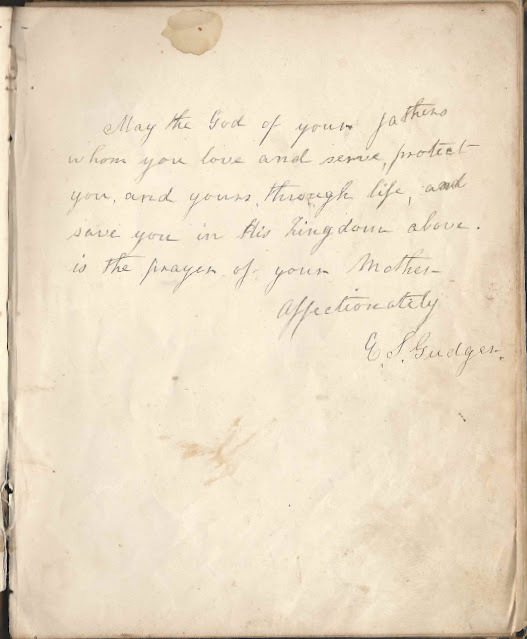 She also worked at the City Missionary Society and the office of the Congregational Pastoral Supply Board. On 3 March 1957 marriage, when she was 63, Lucy married Dr. Charles Clarkson Merrill, son of Rev. John Leverett Merrill and Mary Louise (Murphy) Merrill. 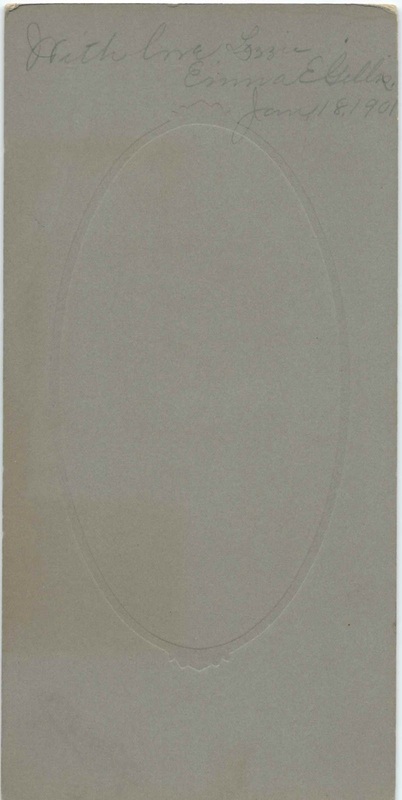 Dr. Charles was born 3 March 1872 at Haverhill, New Hampshire. 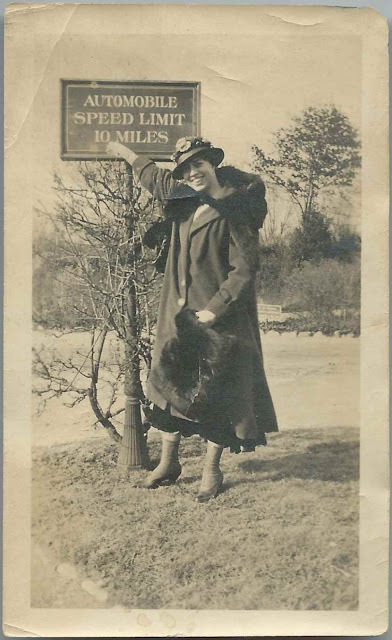 There's an extensive write-up with photographs, of Lucy's life at Find-a-Grave. 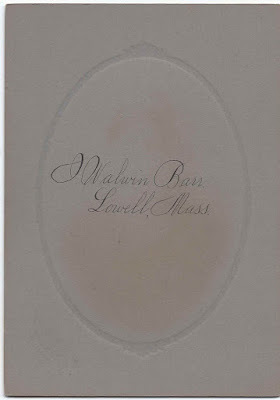 Photograph taken J. Powell of Lowell, Massachusetts, of a young man identified on the reverse as I. Walwin Barr. This was likely the graduation photograph of Isaac Walwin Barr, "Charlie", from either Lowell High School or Lowell Textile School, from which he received a degree in Chemistry and Dyeing in 1900. 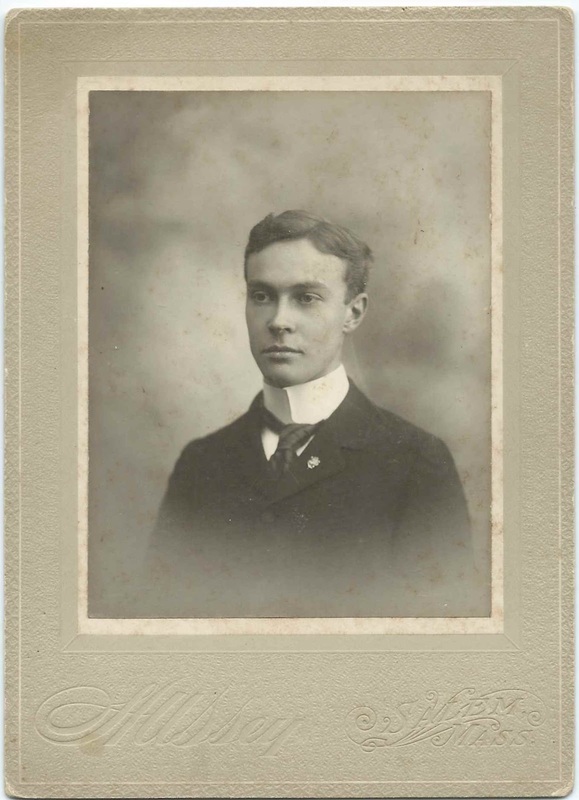 See other posts that feature Lowell Textile School graduation photographs of Nathaniel Trull Ewer and Bartholomew Moore Parker. 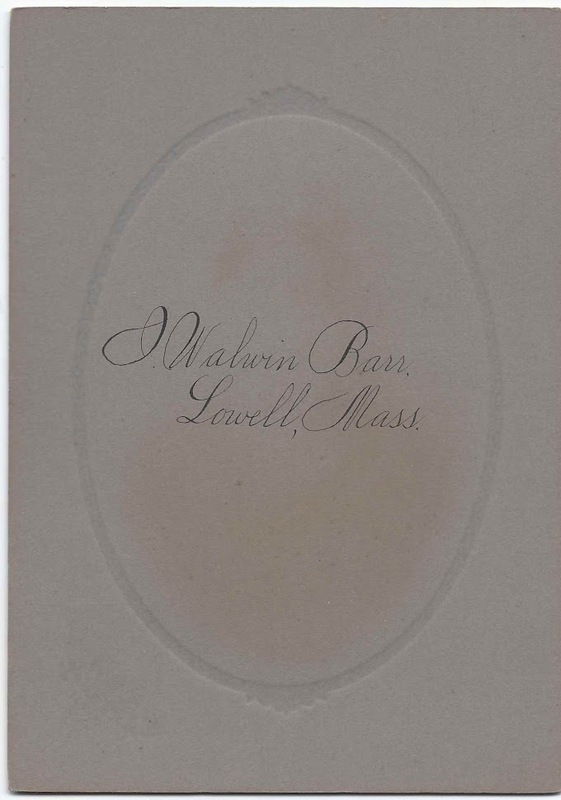 Isaac Walwin Barr was born February 21, 1880 at Lowell, Massachusetts, the son of Isaac and Ann Barr, both immigrants from Ireland - Northern Ireland according to one source. After graduating from Lowell Textile School, Walwin, as he was known, became a chemist in the dye industry and, according to his 1916 passport application, a cotton manufacturer. Here's his photograph from the 1916 application. On 16 June 1909 I. Walwin Barr married Gertrude Gard, "Gertie", daughter of John Taylor Gard and his wife Edna. 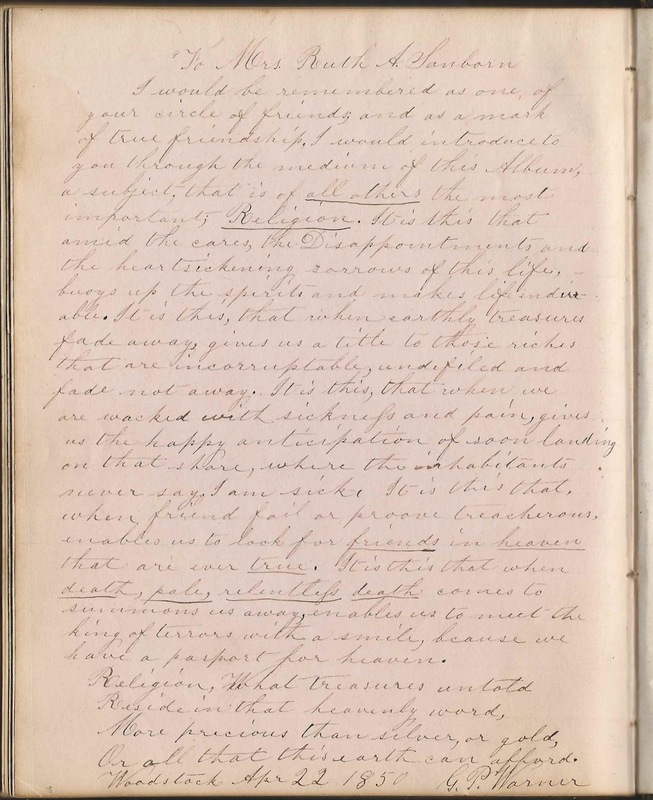 The marriage, according to an item in the June 26, issue of Forest and Stream, took place at the bride's parents' home. 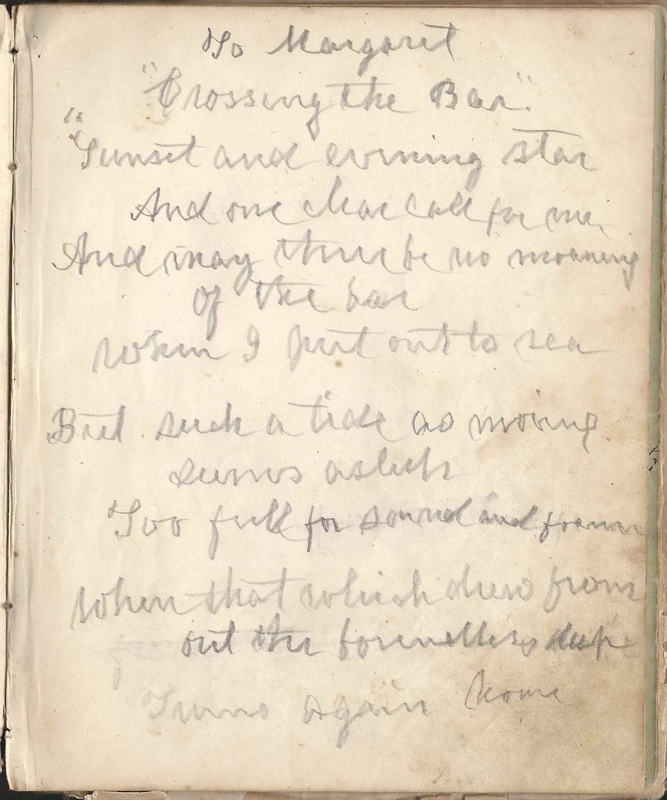 I. Walwin Barr was an avid canoeist and member of the American Canoe Association, which published Forest and Stream. There were at least two children born to the couple, a daughter and a son. They lived in Westchester County, New York, eventually settling at Yonkers. 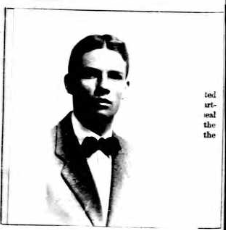 I found a snippet of an article in a 1914 Lowell Sun of Lowell, Massachusetts, indicating that I. Walwin Barr had managed to escape Germany via Liege. Reading the full article would have required a subscription to a genealogy service. 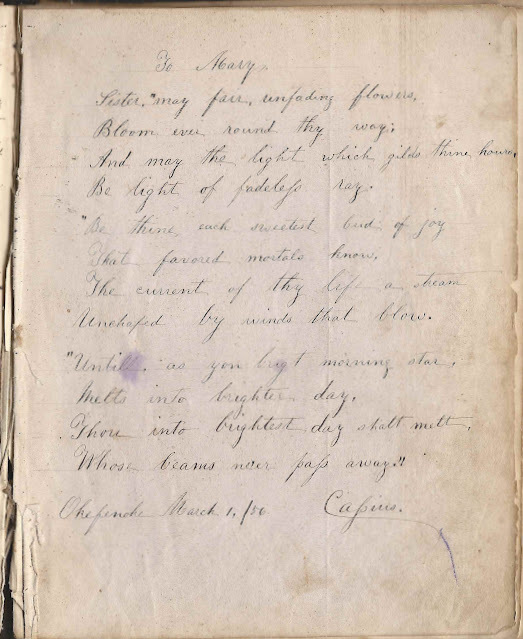 Isaac Walwin Barr had acquired the nickname of Charlie at some point in his life, according to papers from the American Canoe Association [still in existence today] archived at Mystic Seaport Museum. Charlie was Commodore of the American Canoe Association in 1929 and thereafter Chairman of the Board of Governors. 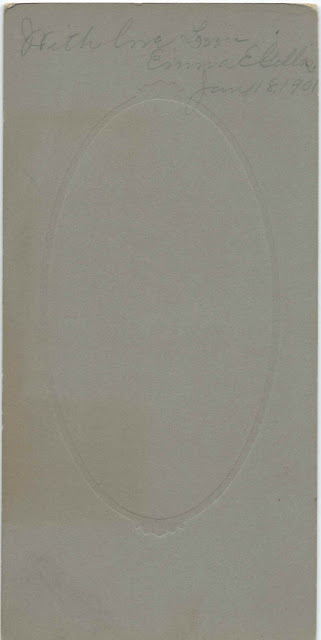 His papers cover the era from 1900 to 1978, though he himself died in 1969. 1899 graduation photograph of Florence Hurd from Salem High School at Salem, Massachusetts. The photograph was taken by the W. G. Hussey studio at Salem. I found two instances of a Florence Hurd born in or near Salem, Massachusetts, during the plausible time frame, but only one of them was still living there at the time of the 1900 Census. 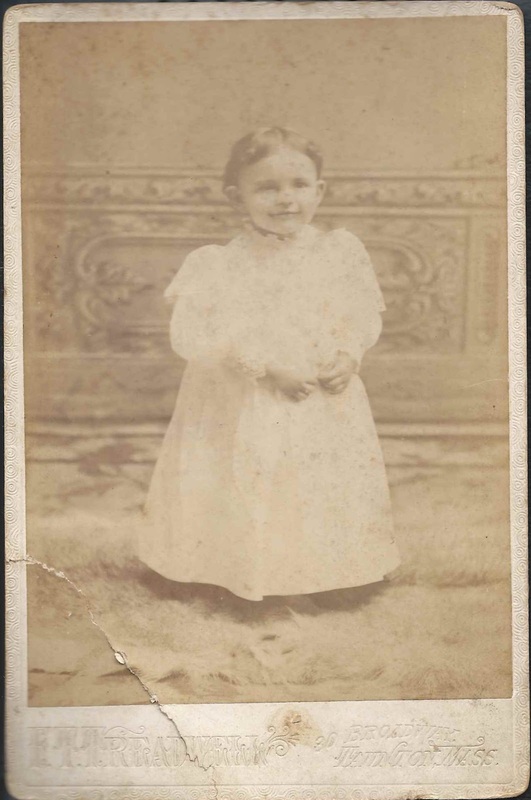 First, the Florence Hurd born 6 June 1881 at Lynn, Massachusetts, daughter of Joseph Almon Hurd and Ida Homer (Varney) Hurd, who were born at Detroit, Maine, and Lynn, Massachusetts, respectively. Joseph, Ida, son Lyman and daughter Florence were living at Salem, Massachusetts, at the time of the 1900 Census. 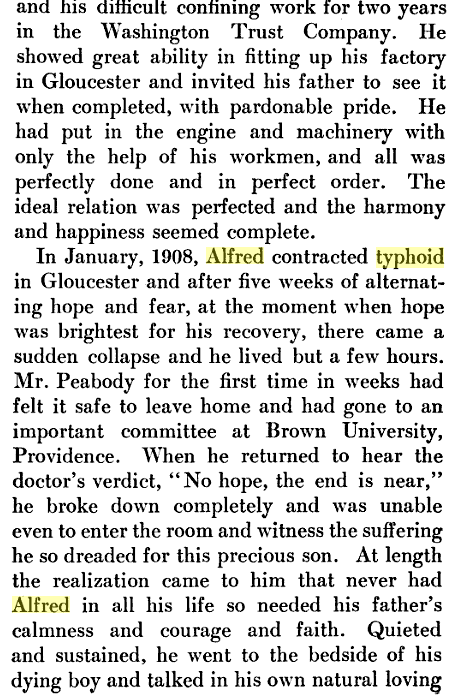 I'm not sure this Florence Hurd ever married; she was living with her lawyer brother Lyman Eugene Hurd at the time of the 1920 Census and may have been a patient at a hospital at Middleton, Massachusetts, at the time of the 1930 Census. 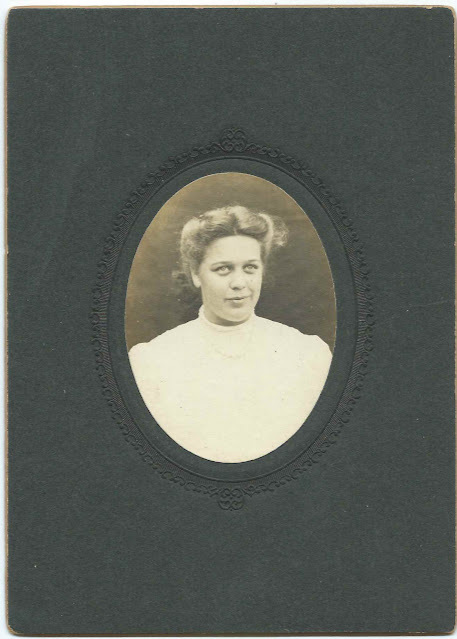 Second, the Florence Sinclair Hurd born 6 September 1880, or 6 October 1880 [I found records for each] at Salem, Massachusetts, daughter of Albert and Ella F. (Wood or Woods) Hurd, "Nellie", who I believe were Maine natives. It appears that this Florence may have been brought up in Lynn, Massachusetts. She married Richard J. Hughes at Lynn, Massachusetts, on 16 September 1900. So we have one Florence born in Lynn who was apparently raised in Salem, and Florence born in Salem, who was apparently raised in Lynn. And perhaps the young woman in the photograph was someone else entirely. If you have knowledge of the Hurd family or families of the Salem, Massachusetts, and Lynn, Massachusetts, area, please leave a comment or contact me directly. Thanks! 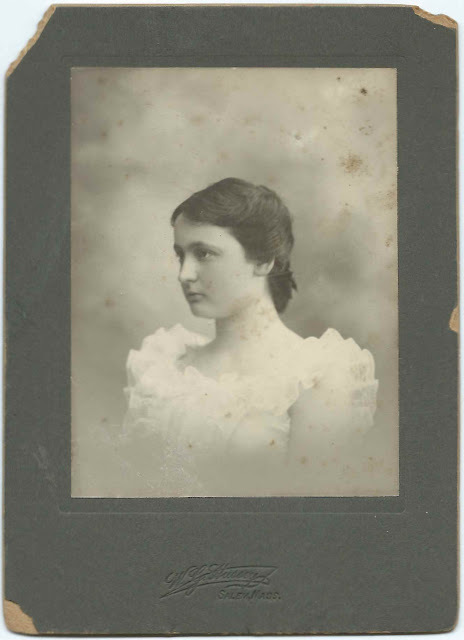 1899 graduation photograph of Helen Hanson Merrill from Salem High School, at Salem, Massachusetts. 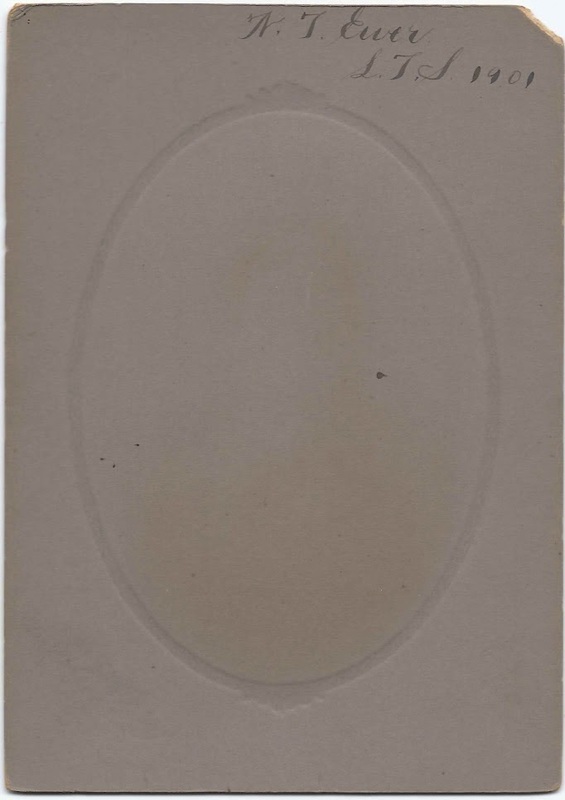 The photograph was taken by the studio of W. G. Hussey of Salem. 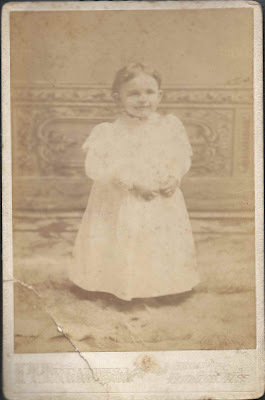 Helen Hanson Merrill was born 1 July 1880 at Salem, Massachusetts, the daughter of Samuel S. and Mary Elizabeth (Fielden) Merrill, who were born at Hallowell, Maine, and Great Falls (now Somersworth), New Hampshire, respectively. Helen's paternal grandparents were William Patch Merrill and Martha Castland (Averill) Merrill. 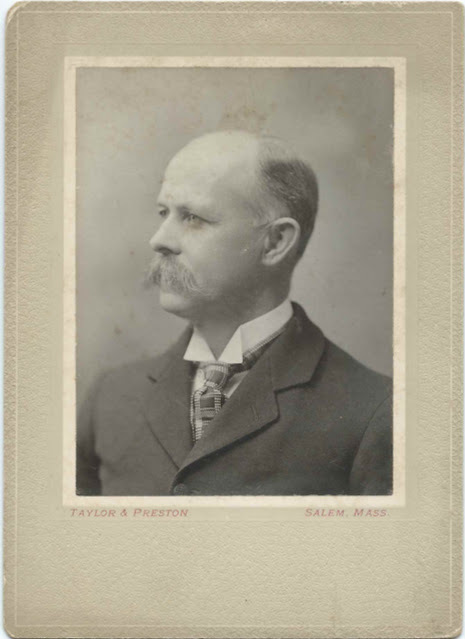 Her maternal grandparents were Thomas and Mary (Hanson) Fielden. On 3 October 1908 at Salem, Massachusetts, Helen married Bangor, Maine, native John Ernest Chalmers, son of Charles L. and Hannah P. (Phillips) Chalmers. John Ernest Chalmers also had Averills in his maternal line. 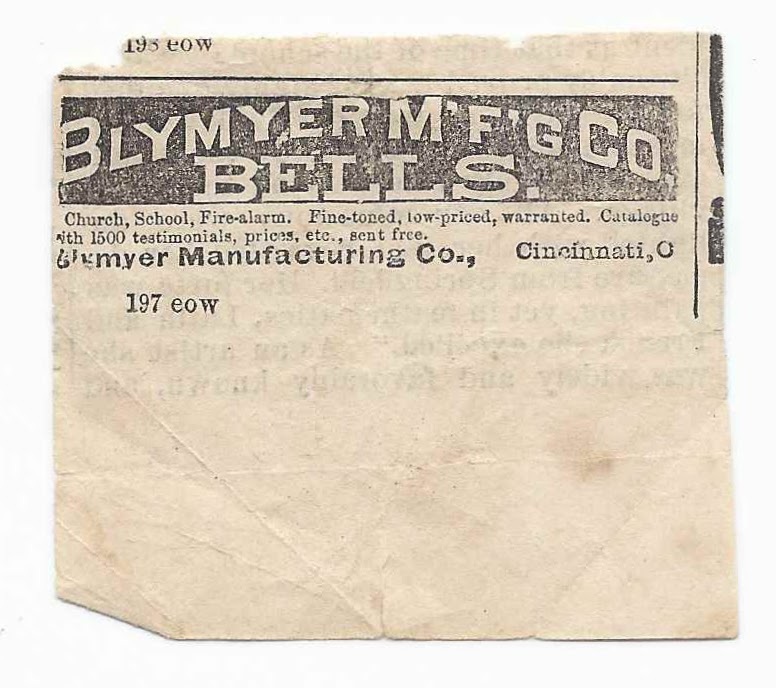 Charles L. Chalmers operated a hardware store at Bangor, Maine, for many years. After their marriage, Helen and John Ernest lived in New Jersey and then at Auburn, Maine, where John was a lumber dealer. They had, I believe, a daughter and two sons. 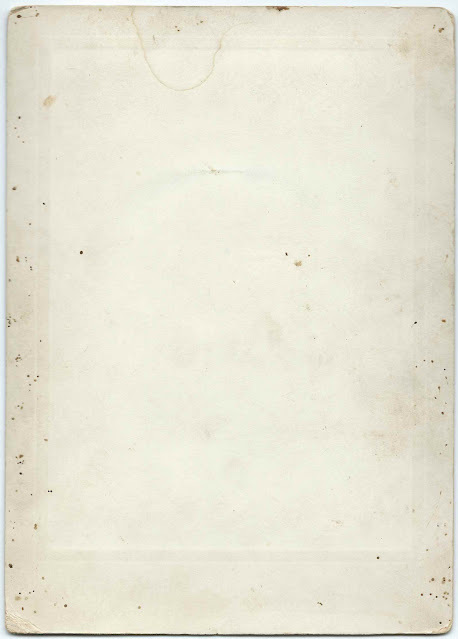 This photograph was found with many others of Massachusetts, New Hampshire and Maine people and scenes. 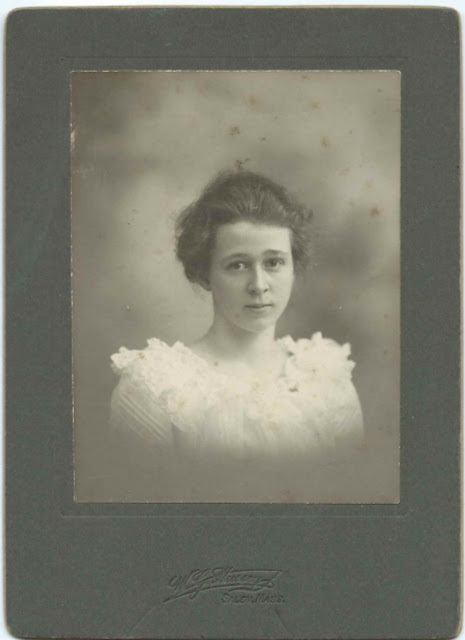 It's tempting to think that the woman pictured in the snapshot below, identified as HHM and taken on March 18, 1917, was Helen Hanson Merrill, but Helen would have been married to John Ernest Chalmers by that date. But perhaps the person who wrote the identification grew up with Helen and used her old initials. What do you think? 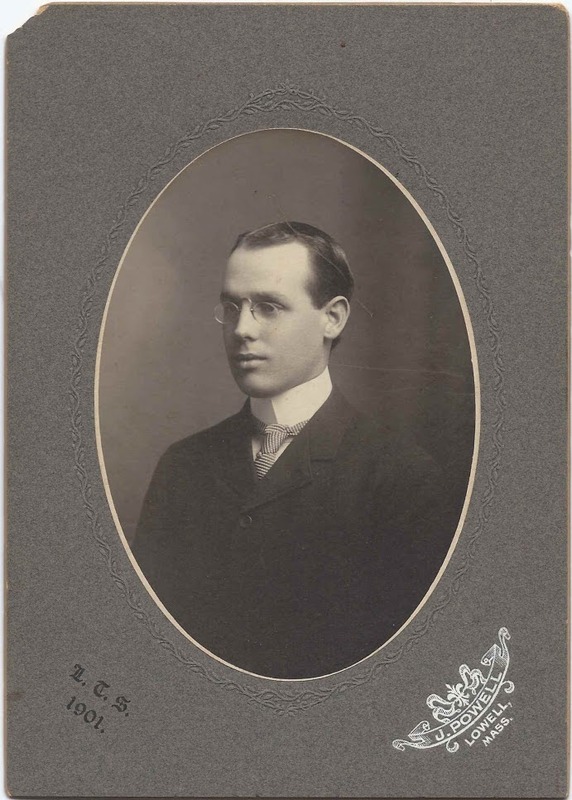 Graduation photograph of Alfred Peabody, taken by the Hussey studio of Salem, Massachusetts of 1899 on the occasion of Alfred's graduation from Salem High School. 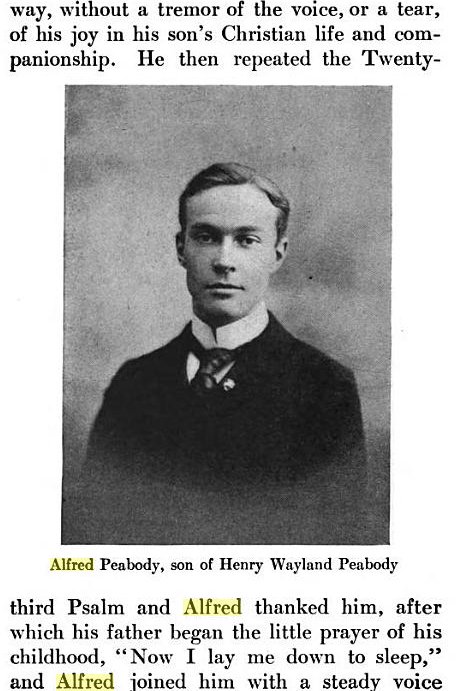 Alfred Peabody was born 5 February 1880 at Salem, Massachusetts, the son of Henry Wayland Peabody and his first wife, Lila Rea (Mansfield) Peabody. 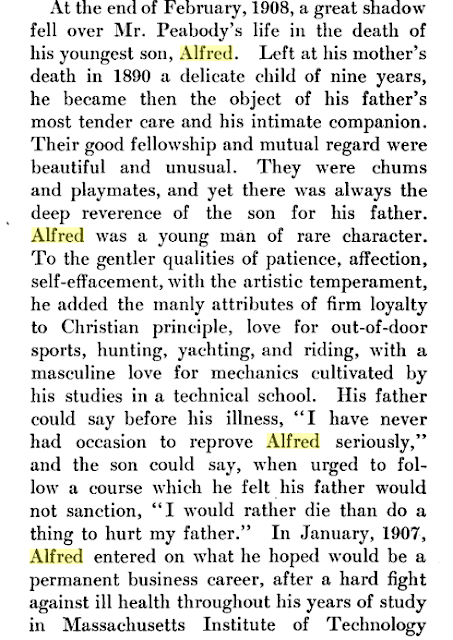 Interestingly, Alfred's siblings had middle names that appear to have been surnames, presumably family surnames, but I didn't find any records listing a middle name for Alfred, the youngest child in the family. 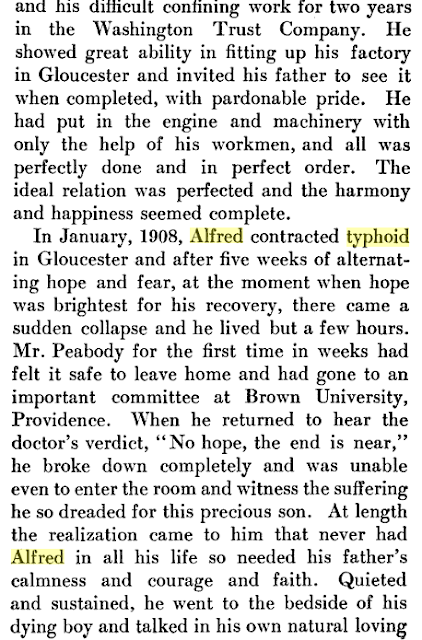 M. H. Leavis wrote a biography of merchant Henry Wayland Peabody in 1909. Alfred had died on 27 February 1908, and an account of his short life and the effect of Alfred's death on his father is covered in a chapter entitled "Crossing the Bar". H. W. Peabody and Company, started by Henry Wayland Peabody in 1867, is still in existence today. If you have corrections and/or additions to the above information, please leave a comment or contact me directly. Thanks! 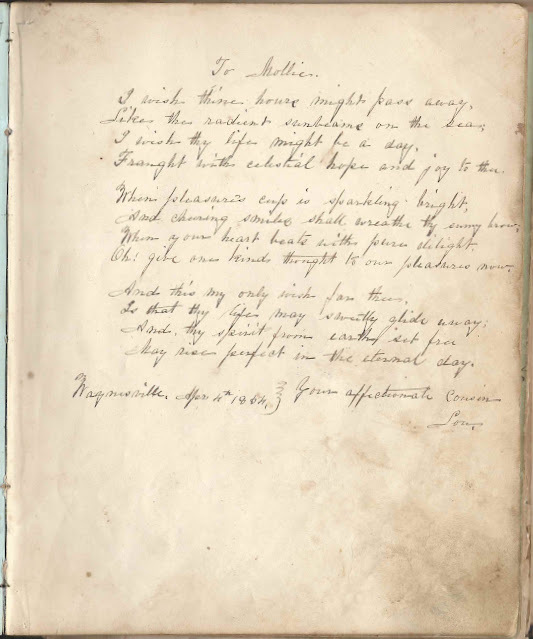 1850s autograph album that belonged to Mary Caroline Gudger, "Mollie", of Buncombe County, North Carolina. 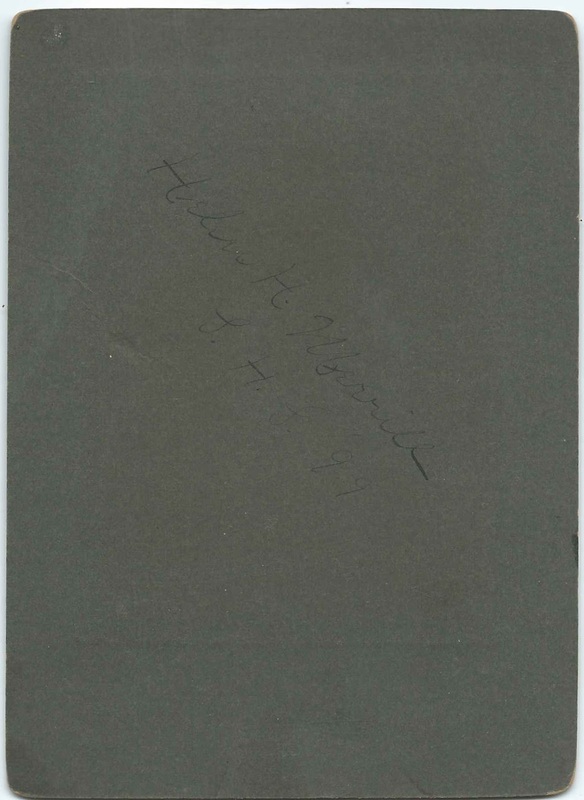 Some of the autographs were collected after Mollie's marriage to William Hamilton Moore. 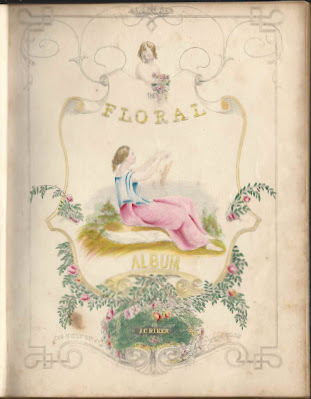 As you can see from the title page, this album was published by the J. C. Riker Company of Fulton Street, New York, and contains lithographs produced and hand colored by the firm that the famous lithographer Fanny Flora Bond Palmer created with her husband at 34 Ann Street. Fanny was most famous as a lithographer for Currier and Ives. 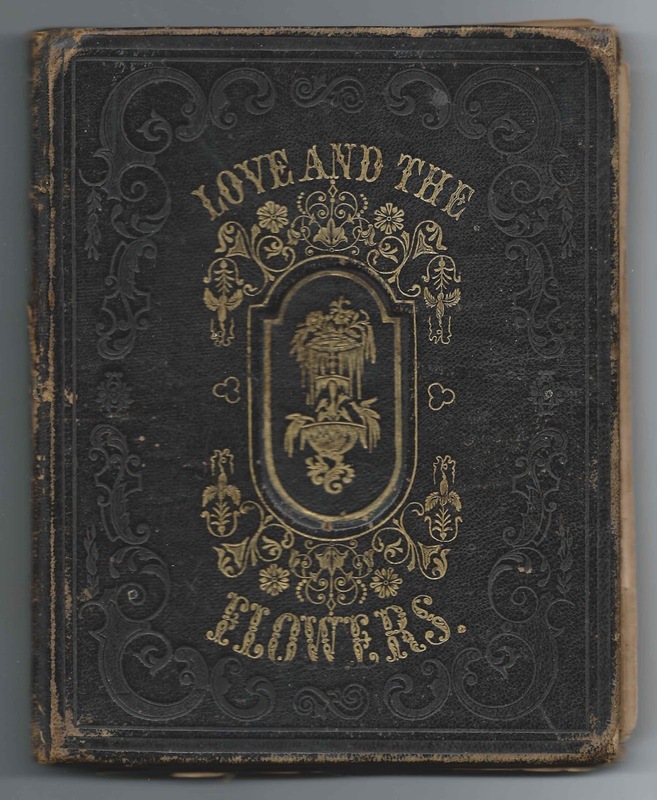 One of the first pages of text in the album was from a later era when Mollie gave the album to her daughter Margaret Elizabeth (Moore) Patton. She inscribed another page and overleaf to Margaret later on in the album. 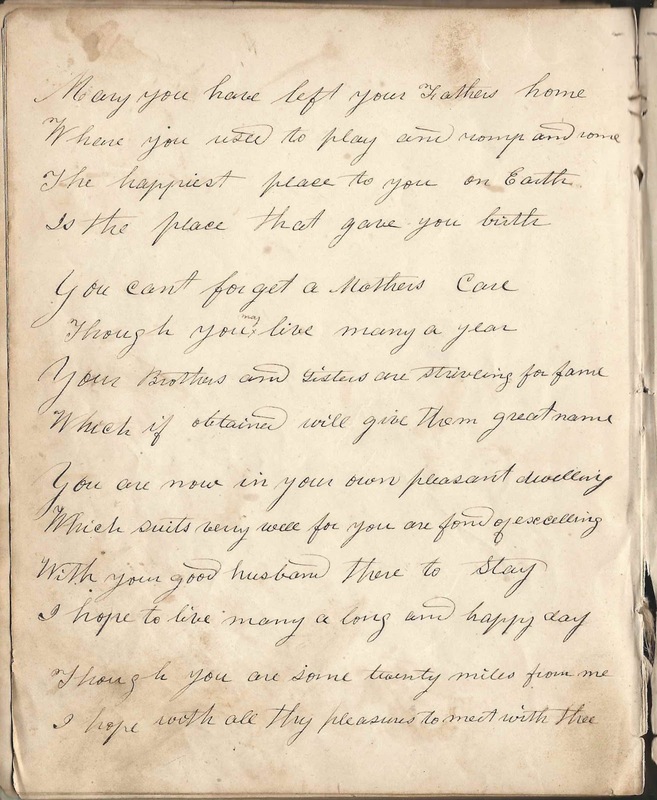 The album is approximately 7-3/4" x 6" and contains the sentiments of 25 of Mollie's relatives and friends, in addition to the two pages Mollie inscribed to her daughter Margaret. 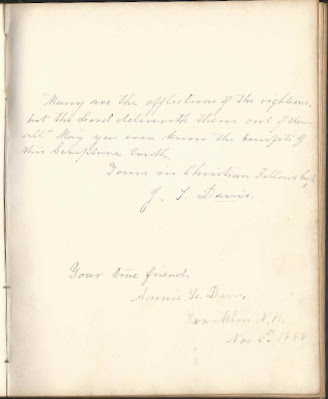 An alphabetical list of the signers appears at the end of this post, though in the custom of that era many people did not sign their full names or residences. Mary Caroline Gudger, "Mollie", was born 21 January 1833 in Buncombe County, North Carolina, the daughter of Samuel Bell Gudger and Elizabeth Siler (Lowry) Gudger, both Buncombe County natives. 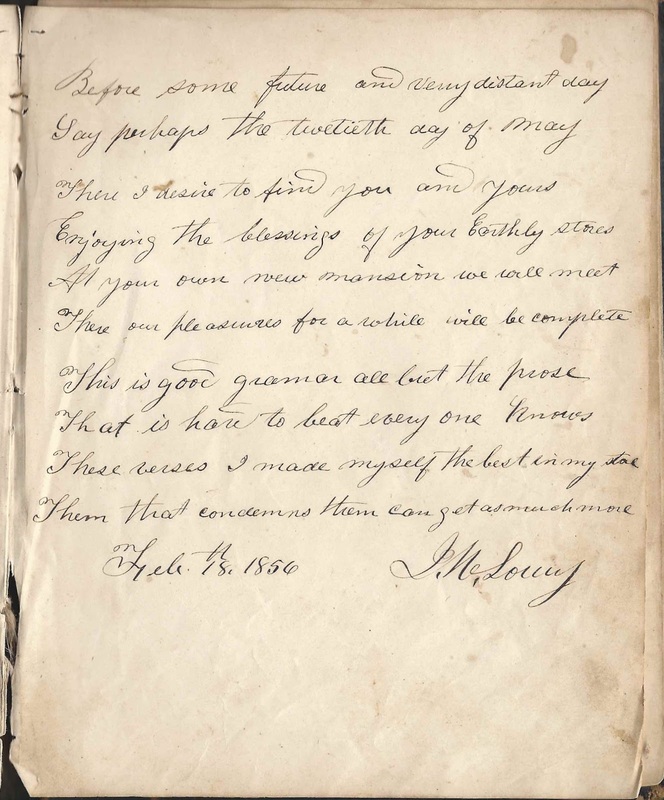 A huge help in identifying the Mollie who owned the album was the page signed by E. S. Gudger who called herself Mollie's mother. Following the page signed by Mollie's mother was a page signed by James Lowry, who possibly was Mollie's maternal grandfather, as he dated his page 18 February 1856, when her grandfather was still alive, and his two page message seems grandfatherly, at least to me. 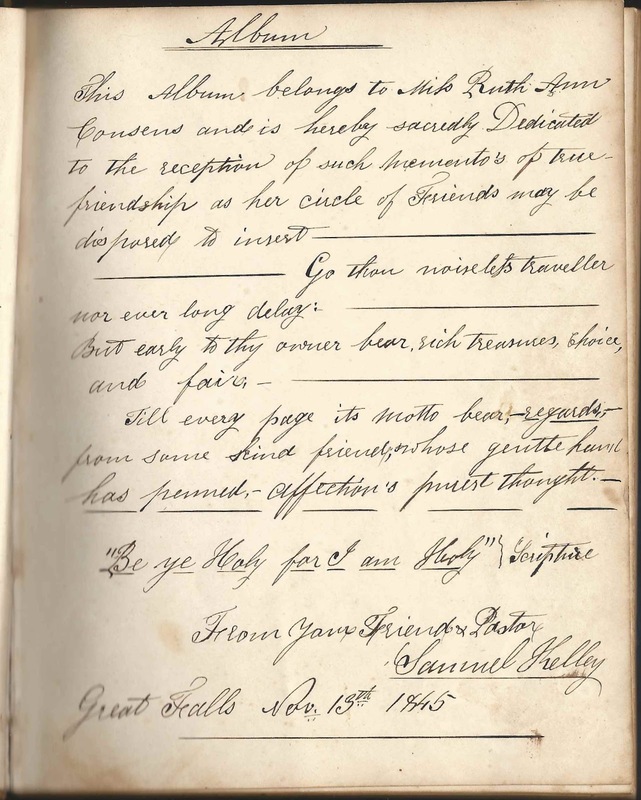 At least three of Mollie's other relatives were among the signers. 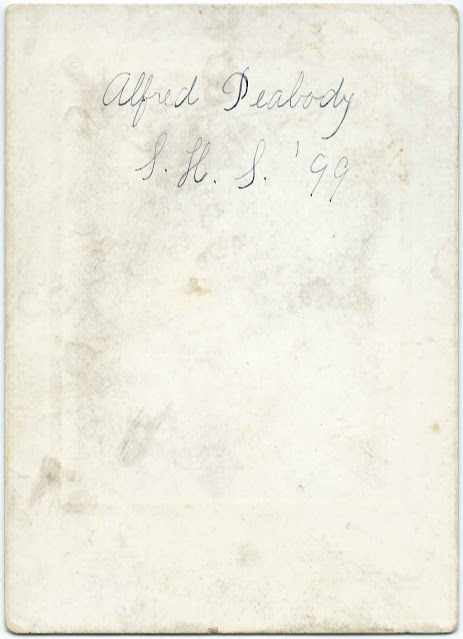 Her brother David, presumably David Madison Gudger, signed the inside front cover and first end paper. 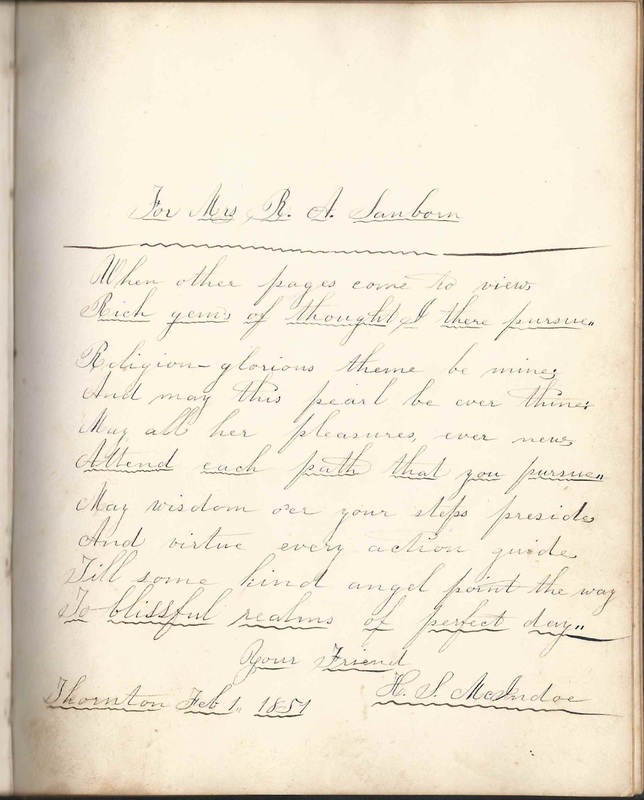 And I wonder if the Cassius who signed a page at Okefenoke, presumably in the Georgia/Florida area, on March 1, 1856, was another brother, James Cassius Lowry Gudger. Mollie's cousin Lou signed a page at Waynesville [no state given] on April 4, 1854. Cousin Jim signed a page and overleaf at Sand Hill [no state given] on March 13, 1856. Mary Caroline Gudger, "Mollie", married William Hamilton Moore on 17 October 1855 in Buncombe County. 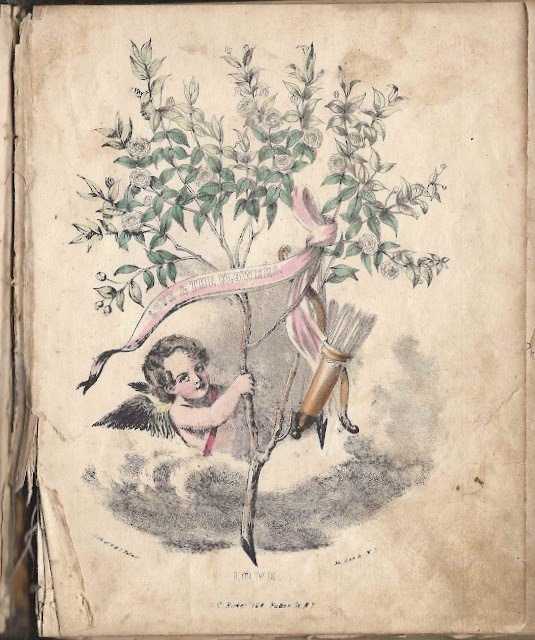 William was born in Buncombe County, North Carolina, on 24 April 1812, the son of Charles Augustus Moore and Margaret (Penland) Moore. William had been a merchant in his early years and served in the military during the Cherokee Disturbances in 1838. After his military service, he became a farmer. 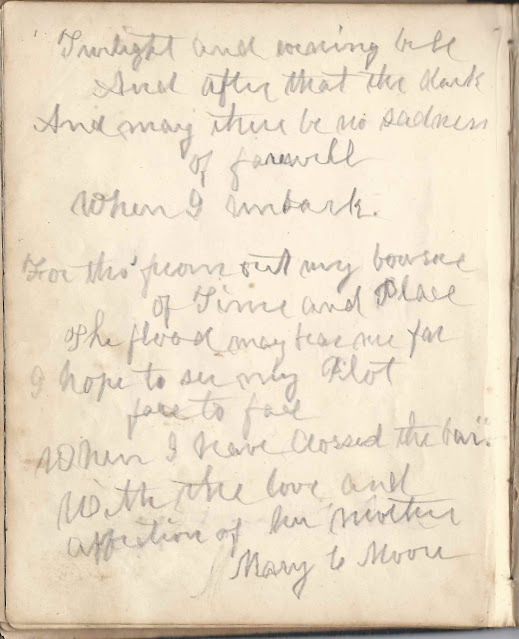 It's interesting that some of the entries after Mollie's marriage are inscribed to Mary. 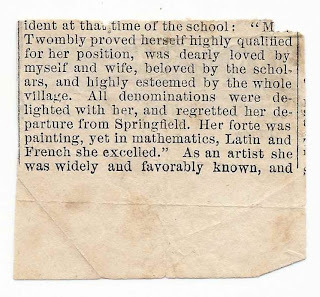 Perhaps these were new acquaintances unfamiliar with the nickname or perhaps Mollie had decided to use her given name. Walter Evans Moore, born 14 October 1856; married Laura Rebecca Enloe. 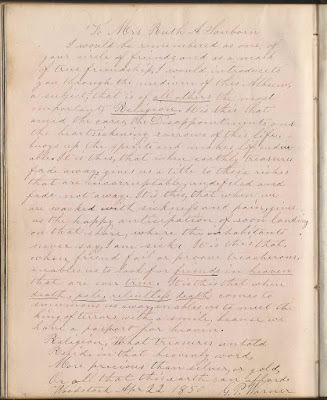 I found a wonderful account of William Hamilton Moore and Mary Caroline (Gudger) Moore and their children here, including a description of Mollie's pleasant disposition and penchant for story telling, some of which stories made their way into "Aunt Mary's Story Book for Children", a collection typed up by Charles J. Rice in 1913. 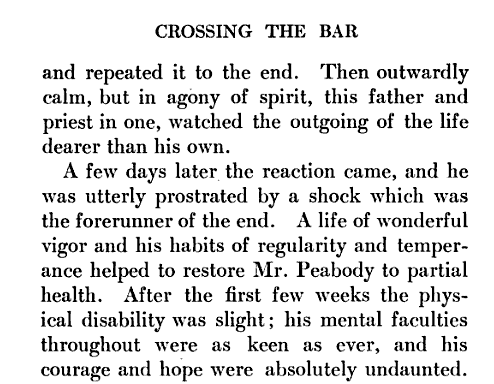 William died in 1879. 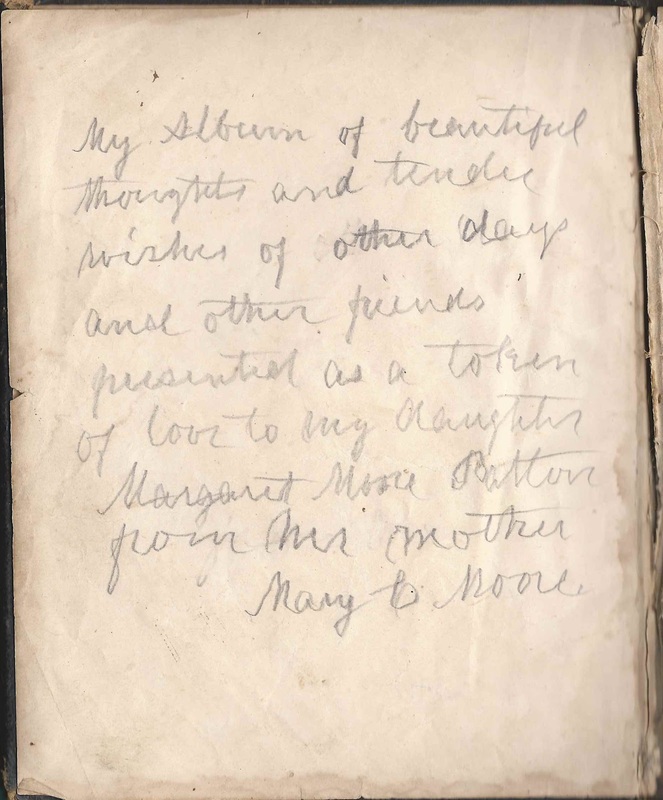 It appears that Mary didn't remarry; she died in 1917 in Hominy, North Carolina, after living with daughter Lucy Swain (Moore) Gaston and her family for 25 years. If you have corrections and/or additions to the information above, or information or insights into any of the signers listed below, please leave a comment or contact me directly. Thanks! This page and the overleaf signed by someone whose initials are hard to decipher, perhaps C. P. M., or P. M., or ? 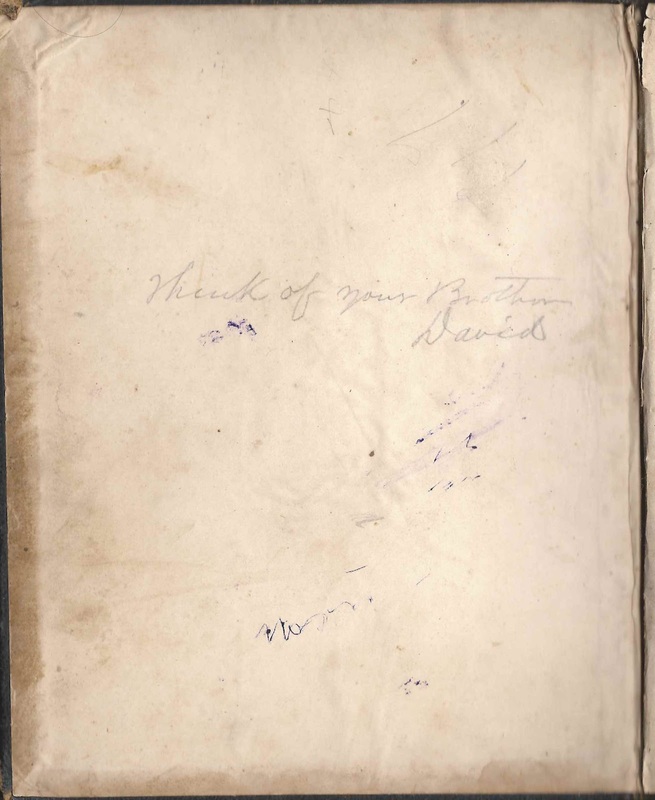 S. Jones, signed a page and the overleaf at Pleasant Hill, on November 28, 1857. Not sure of first initial - could be T or ? 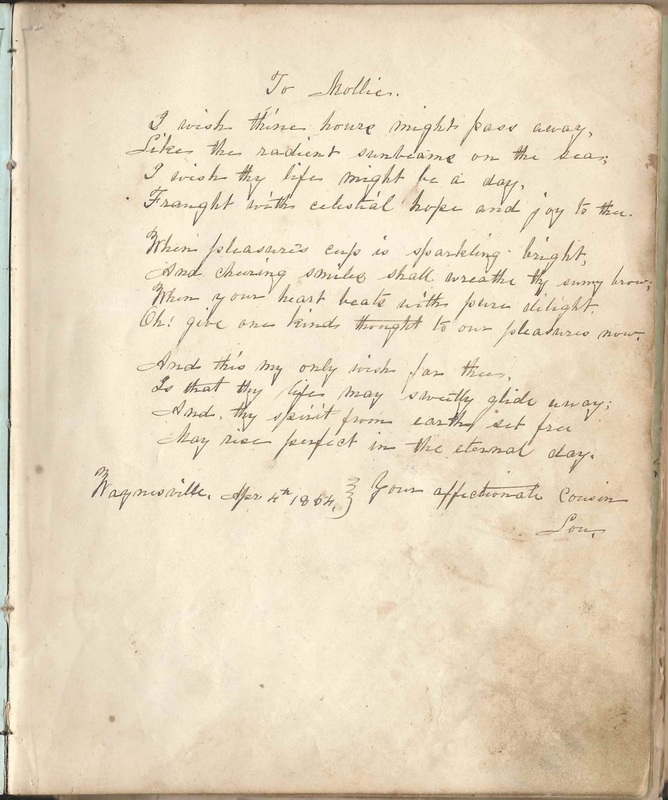 This page and the facing page signed by J. M. Lowry on February 18, 1856. 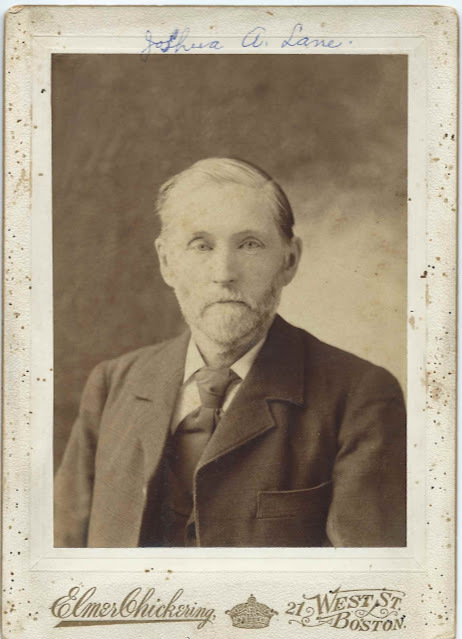 He may have been James Lowry, Mary Caroline (Gudger) Moore's maternal grandfather, who lived until 1857. Mary Caroline (Gudger) Moore of North Carolina, album owner. 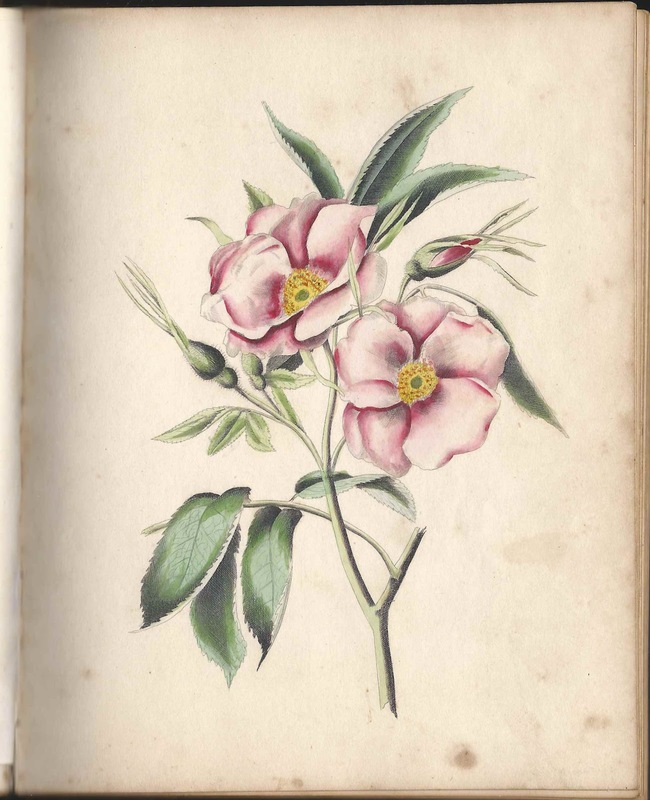 She wrote in the front of the album explaining that she was turning the album over to her daughter Margaret; and she wrote another page to Margaret in the middle of the album that ran over onto the overleaf. 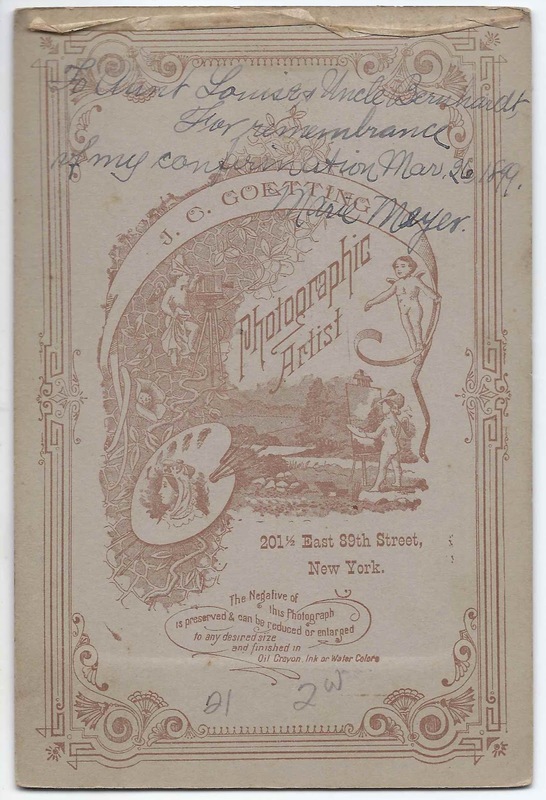 1899 photograph taken by the J. C. Goetting studio of 201-1/2 East 89th Street, New York, New York, of Marie Meyer at her confirmation. 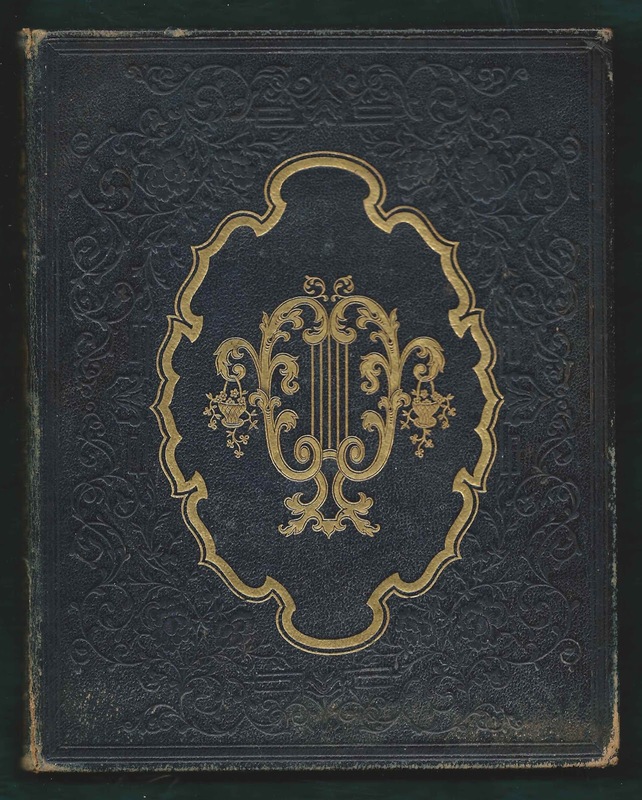 The photograph was intended to be a gift for Marie's Aunt Louise and Uncle Bernhardt. 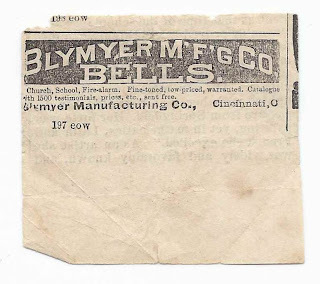 If you have information on which Marie Meyer she might be, helped along by the clues of the names of her aunt and uncle, please leave a comment or contact me directly. Thanks! This photograph was purchased with an older one, a carte de visite possibly of Baroness Agnes (von Harlessem) Busse and her child, though I don't know if there is a relationship. 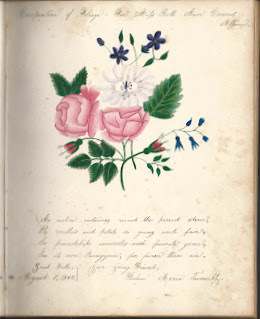 Autograph album given by Pastor Samuel Kelley on November 13, 1845 at Great Falls, New Hampshire, to Miss Ruth Ann Cousens. 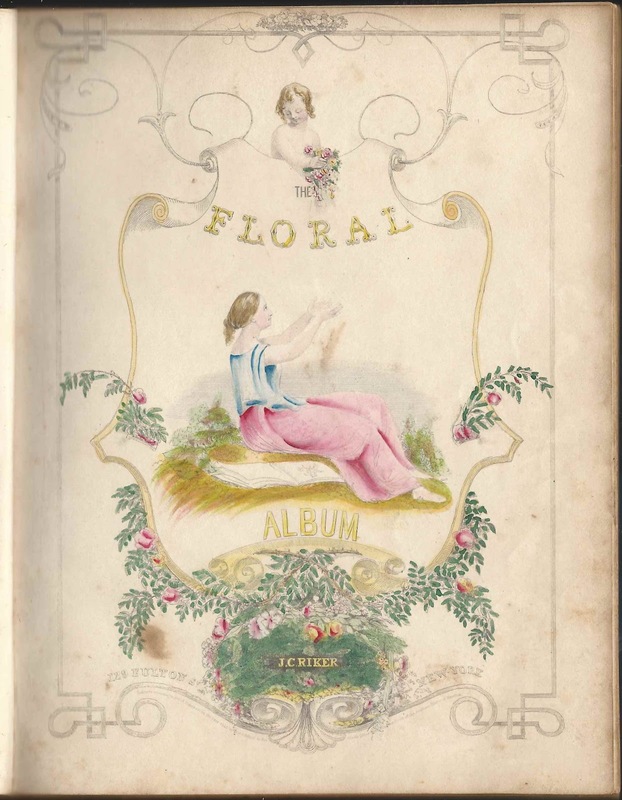 Aside from the pages of sentiments, the album contains several pages of hand-colored illustrations, shown at the end of this post. The album is approximately 7-3/4" x 6" and contains the sentiments, many full page, of 18 of Ruth's relatives and friends. Several were pastors. 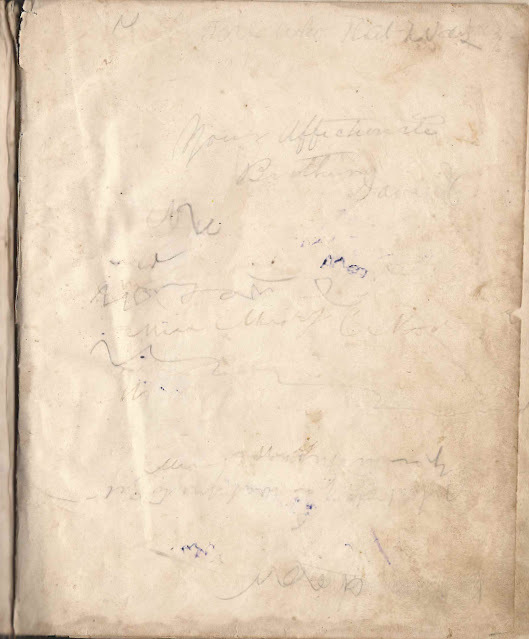 An alphabetical list of the signers appears near the end of this post. 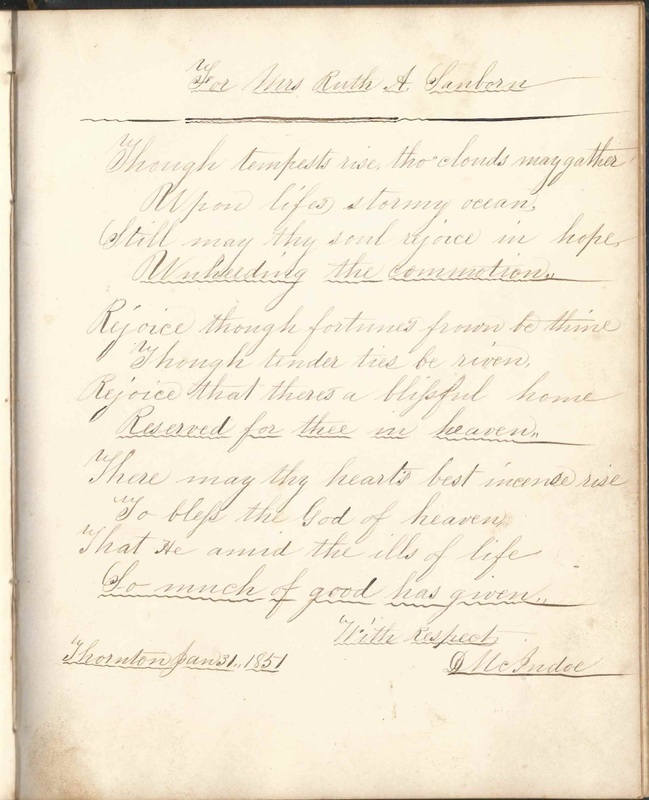 Ruth Ann Cousens was born 6 October 1825 at Kennebunk, Maine, daughter of Jeremiah and Eliza (Kimball) Cousens, who were both born at Wells, Maine. 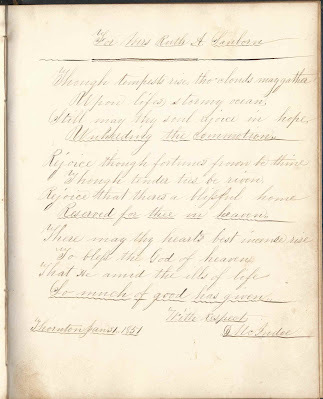 Ruth's younger sister Vialette M. Cousins, or possibly Violette M. Cousins, signed a page at Kennebunk, Maine, on March 5, 1848. 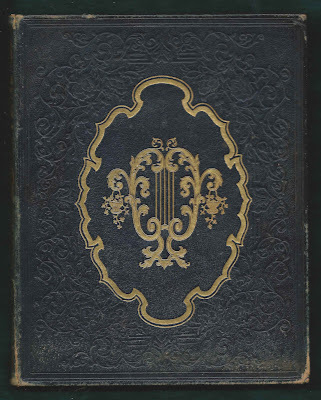 By 1845, it appears that Ruth was at Great Falls, New Hampshire, now Somersworth, where she was presented this beautiful album by Pastor Samuel Kelley. 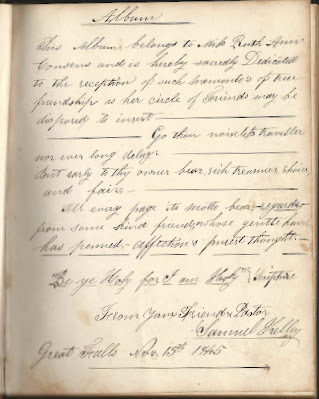 On 9 March 1848 at Great Falls, New Hampshire, Ruth married Nathan Bachelder Sanborn, son of Jonathan (Tilton) Sanborn and Hannah (Page) Sanborn. Nathan was born 6 October 1821 at Belmont, or Gilmanton, New Hampshire. 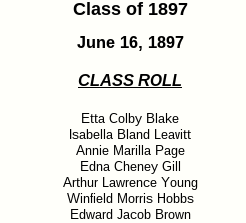 They lived at Great Falls, then Thornton and then Gilmanton, New Hampshire. They had, I believe, seven children, only one of whom died in childhood. Both Ruth and Nathan died in the spring of 1892. 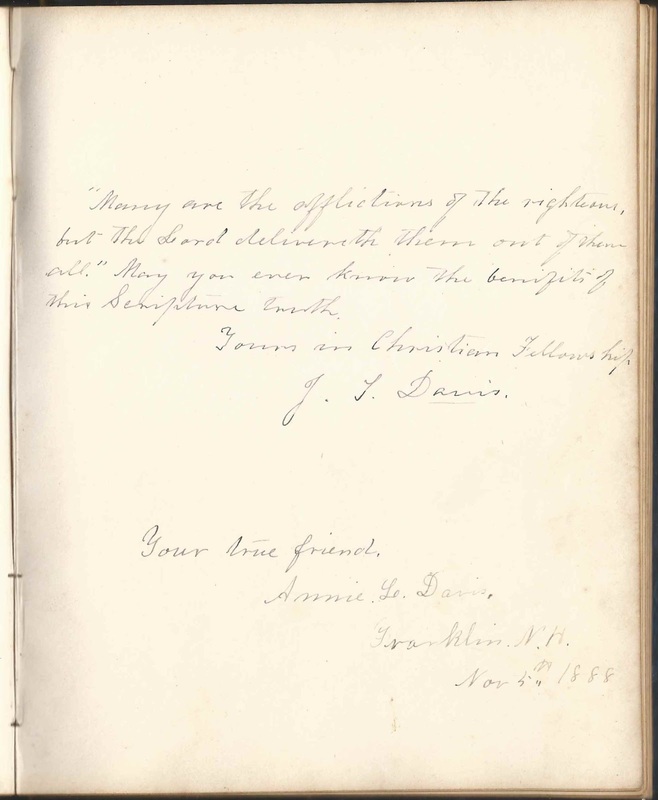 Reverend Jefferson T. Davis and his wife Annie Louise (Brown) Davis of Franklin, New Hampshire, signed a page in 1888, the latest signatures in the album. G. P. Warner signed a page at Woodstock, presumably New Hampshire, on April 22, 1850. He was likely Rev. Greenleaf P. Warner. 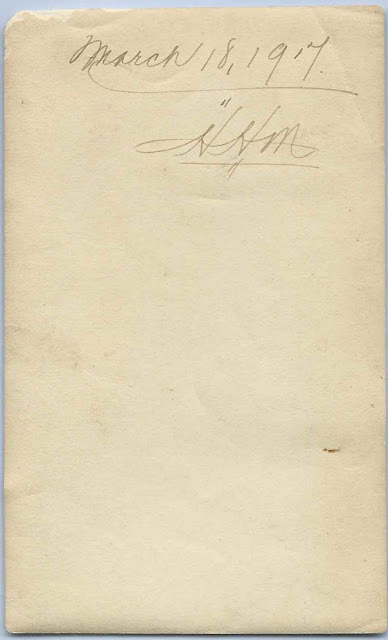 Reverend David McIndoe and his wife Hattie Smith (Youngman) McIndoe, then at Thornton, New Hampshire, signed pages, he on January 31, 1851, and she on February 1, 1851. Two mementos were loose in the album, an embroidered bookmark with the initials V.A.S. 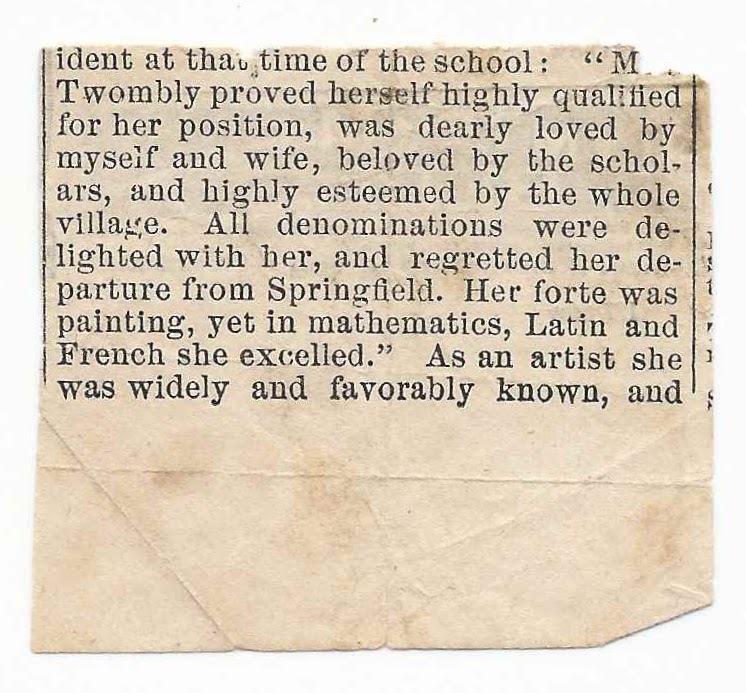 and a truncated newspaper clipping about a woman named Twombly. 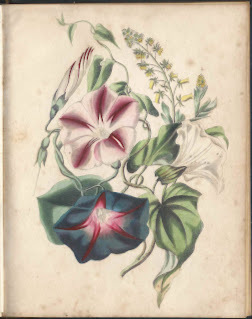 Vialette M. Cousens, signed at Kennebunk, Maine, on March 5, 1848. She was Ruth M. Cousen's younger sister. 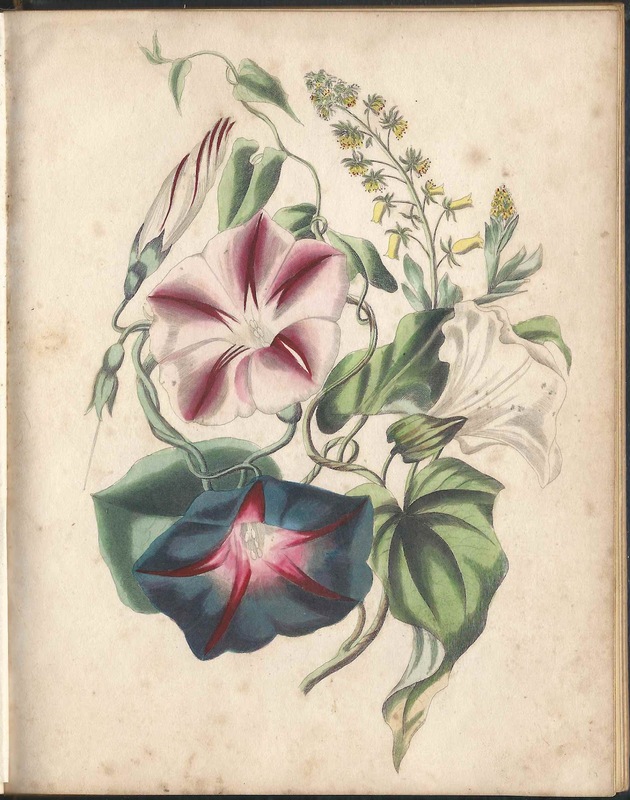 She appeared to spell her name as Vialette, but I also found records for a Violette M. Cousens. 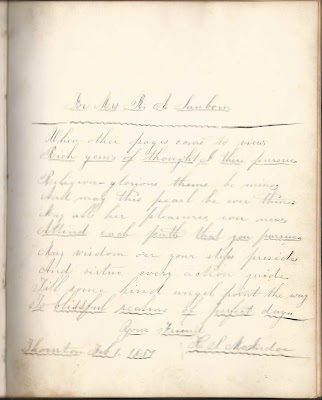 Inscribed to "Sister Ruth Ann"